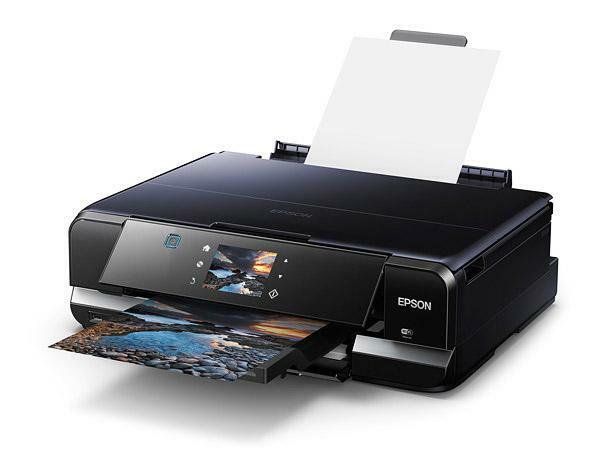 Epson calls the XP-950 an "occasional A3 Multifunction Premium Photo Printer". And I am a reasonably talented — on a good day — amateur photographer, shooting a Canon EOS 7D DSLR camera with a variety of quality Canon lens. 'Do we go together?' is the question. I think the correct term in the world of photography to describe my level is prosumer. In other words, I'm pretty fixated, prepared to spend reasonable money on equipment — including a printer — but I expect results from what I own. So when Epson’s jovial marketing man gave me the chance to give this printer a go, I decided to take up the challenge. Firstly, it should be noted that I don’t like printers. They are usually complicated, evil beasts, with minds of their own. They take so long to set up you almost always end up wondering whether it’s worth the effort. This one was delivered already set up, but I can see by some fiddling round that it has a level of difficulty that may make it a challenge for a tech newbie or anybody that just wants to push a few buttons and have everything happen. However, in general, once I got the notion of how the front touch panel pretty much led you wherever you needed to go in terms of printing, possibilities and potentials, then it was relatively easy to get around. What I was interested in was how this all-in-one inkjet stacked up in terms of fine photo printing. The answer is pretty well. Before I get to that, a couple of salient points: the six ink cartridges are easy to change, the various paper feeds similarly functional once you work out how to choose the paper you want in a drop-down menu that appears when you hit 'print' on your computer. For this test, I used my 27-inch iMac, which is loaded with the full Adobe suite and Canon’s standard Digital Photo Professional editing software. Like any photographer who is shooting higher-end DSLRs, I shoot t the majority of my images in RAW mode as it allows greater ability to edit photos precisely and get exactly the colours you want — and are trying to capture. As such, it also means that when it comes to a printer I want something that will render those photos as accurately as possible — because usually I’ve spent some time getting them just right. I also don’t want to spend all day waiting for the printer to deliver those prints. There is nothing more frustrating that waiting 10 minutes while an inkjet grinds out a print and then find that the colours look like they’ve been bled of any life or feeling. Over three days, I put the Epson through a pretty grueling cross-country of printing, asking it to deliver everything from scenic and fireworks shots to portraits of the family dog, close-ups of birds and flowers, and the colour and contrast that is the Vivid Festival in Sydney at night. I printed on matte, gloss, ultra-gloss, semi-gloss and plain, and found the XP-950 to be flexible and very capable, with a few codicils to that latter statement. Firstly, speed is good. A3 prints on high-quality semi-gloss paper achieved the best results visually so I tended to print more of them. It only took a few minutes to get each print; the colours, while just a little muted, were generally very good indeed. The worst outcomes were browns, which tended to become somewhat redder and lighter, and the printer seemed to struggle a little with contrasts in the Vivid night photos, which meant they ended up losing that ‘wow’ factor you are looking for as photographer. They aren’t, of course, perfect, but they are good enough for framing and I would be proud to own up to them as they hung on a wall. And that’s what you are looking for. I found the A4 prints on semi-gloss were similarly good while the gloss 5x7in prints lacked a little in terms of crispness. Ultra-gloss A4 prints were a little darker and not quite as detailed as the original, but quite acceptable in most cases. Matte prints don’t do a lot for me — I think they look flat, in general. And that is a paper issue not a printer issue. As a rule of thumb don’t expect photo printing to look any good on plain paper — it won’t. And these didn’t. So where does that leave us? With a printer that will satisfy the printing needs of most prosumer photographers and those who demand even less. Professionals may demand a little more, but all-in-all the Epson XP-950 is a very good little printer and it also networked to all my other Mac devices easily and worked very well as an everyday printer and scanner. Recommended. Price: $399 (Epson website) until August 31, 2014.